Our commercial patio heaters can make your patio area a comfortable destination for customers year-round. We offer a number of commercial patio heating options depending upon your tastes and budget, including natural gas heaters, electric heaters, propane heaters and more. Perfect for restaurants and other businesses whose patios are featured prominently. When the cold weather hits, our portable heating units are up to the task of keeping things warm and toasty for your guests. 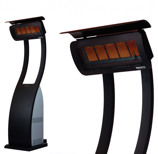 Our website features outdoor heaters for patios, sitting areas and more from our industry's most revered and respected manufacturers. We will work with you to find just the right solutions for your business heating needs, and believe you will find our website to be easy to use and even easier to order from. When the cool weather hits, your patio can still serve as the place to be. 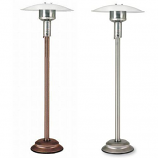 Choose from our selection of outdoor heaters for patios to ensure your guests are warm and toasty. You'll love the options you find on our site. We want your experience with us to be a positive one on every level. From the great products and prices you find to ease of ordering and timely shipping and, of course, our impeccable customer service, we believe you will find commercialheater.com to be a valued resource. Begin your search for the perfect commercial heating solutions right away. It won't take you long to discover a number of great options that are perfect for you and your business' patio.